Heat grill. Cook bacon in medium skillet over medium heat for 2 to 3 minutes per side or just until bacon begins to brown but is not crisp. (Bacon needs to be pliable to wrap around turkey.) Drain on paper towels. Cut each turkey tenderloin crosswise into 4 pieces; press the 2 tapered end pieces of each tenderloin together to form 1 piece. Wrap 1 partially cooked bacon slice around each piece of turkey; secure with toothpicks. Brush both sides of each with oil; sprinkle with pepper and thyme. When ready to grill, place bacon-wrapped turkey on gas grill over medium heat or on charcoal grill 4 to 6 inches from medium coals. Cook 12 to 15 minutes or until turkey is no longer pink in center and bacon is browned and crisp, turning once. Remove toothpicks before serving. 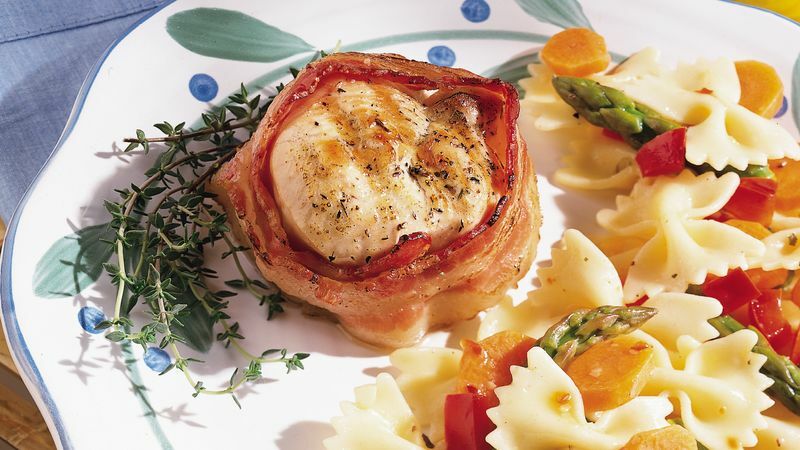 To broil bacon-wrapped turkey, place on broiler pan; broil 4 to 6 inches from heat using times above as a guide, turning once. The tapered ends of turkey tenderloins will cook unevenly. Pressing two tapered ends together forms a piece that is the same size and shape as the center pieces. Turkey tenderloin is very lean. As these mignons grill, watch them carefully so they do not overcook and dry out. The bacon is partially cooked so it is pliable enough to wrap around the turkey pieces. Toss cooked pasta and veggies with Italian dressing for an easy accompaniment.